My Engle Compressor Fridge has now completed both 2014 & 2015 Travels with me totaling over 29,000 miles with it running for a total of 7 months. Not including my usage at home. 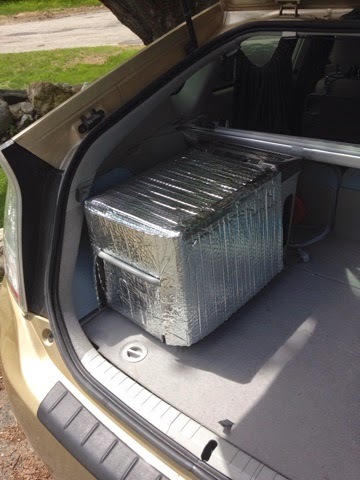 This year the Prius created a challenge for me with the fridge over last year using it in the Class B Campervan. Last year the height of my Class B inside was over 6 feet tall from the floor. 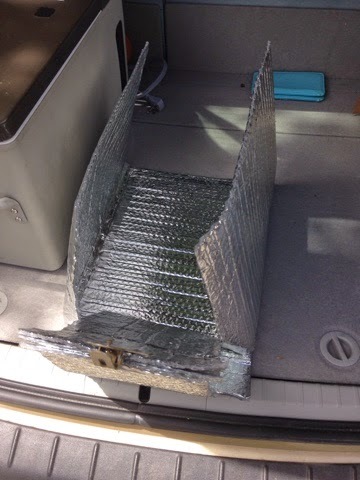 Even when I parked the Class B for an all day hike in the Arazona sun the floor was relatively cool with roof vent and sliders open compared to the Prius that would get 120 degrees inside with windows cracked. 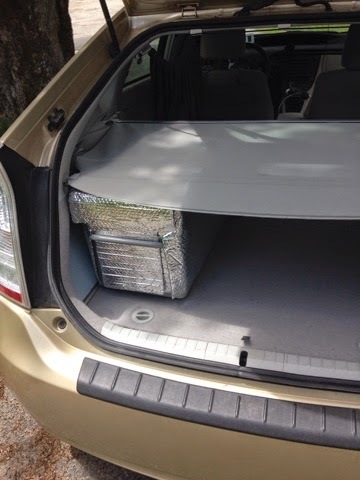 I decided I would insulate the exterior of the fridge but since I had it under the security screen in the back of the Prius I did not have the space to add much insulation. The decision was to use Reflectix that was cut to a packaging design that would fold up small when not in usage, but would give me some insulation. When folded at right angles it would slide on top of the fridge leaving the controls and compressor ventilation open. The design used the handle on one side to slide the cut wings behind to hold it in place and still have the handle available to lift if needed. This design worked very well and used very little space but did provide the ability for the fridge to run less. As noted I would hike for up to 6 to 8 hours at a time and wanted to limit the fridge running. I would leave the Prius in "ready mode" (on but not running) and manually lock the doors and the high voltage battery would feed the Prius 12 volt battery until the high voltage battery needed to be charged and the Prius would start all by itself for a minute or two every hour. The fridge would run fine this way for my whole trip during the day. 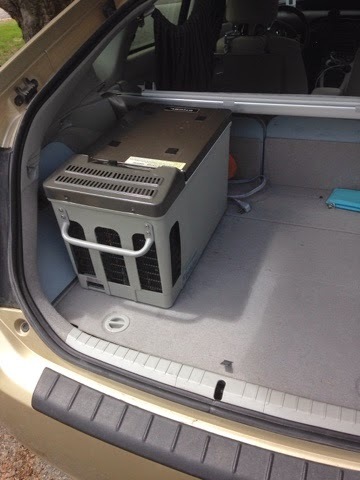 At night I ran the fridge off of my house batteries so the Prius would not have to run and this allowed me to also stealth while keeping my food fresh. You may think that letting the Prius stay in Ready Mode and run when it needed to is highly inefficient. It's not. My 19,500 miles this year overall average mpg was 52.1. It would have been higher if I didn't operate the Prius this way but it worked for me.